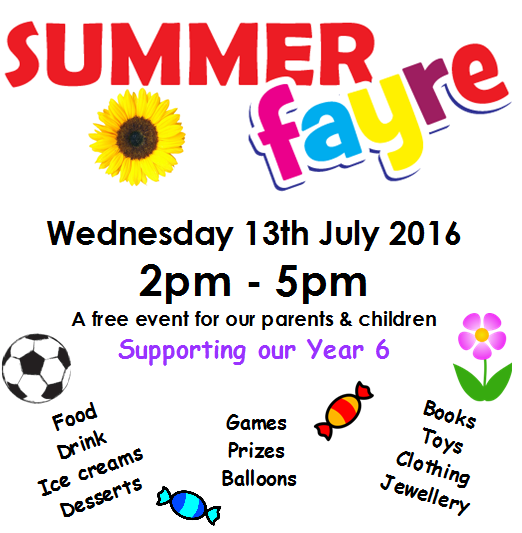 Hodge Hill Primary School would like to invite you all to our School Summer Fayre on Wednesday 13th July. Stalls will be open from 2pm-5pm, with a variety of activities. There will be drinks and snacks available to buy, as well as games and activities for the children to enjoy. All money raised by the PTA has kindly been donated to the Year 6 children to fund their end of year celebrations. - Children can be collected form their classrooms early at 2pm by their parent. Children cannot be collected after 2pm. - Children not collected early must be collected at normal time, and will visit the Fayre under the supervision of their class teacher. We are looking forward to the Fayre, we hope you are too!